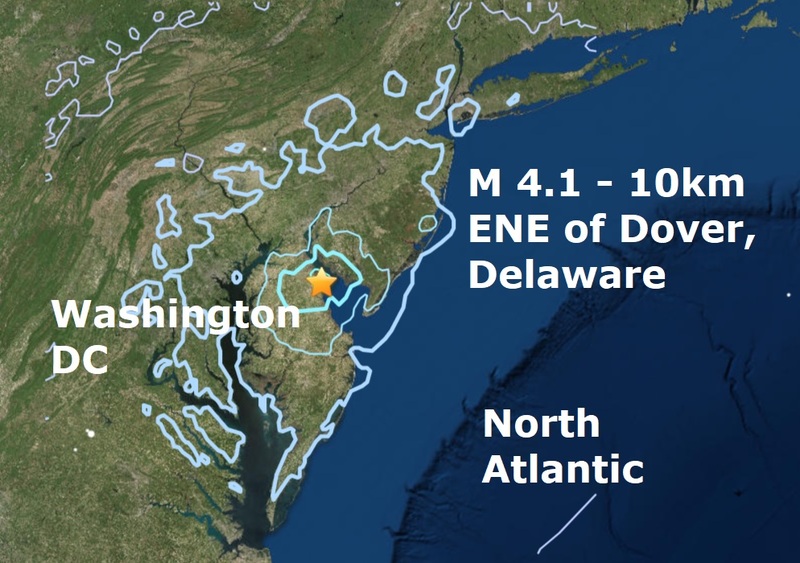 Earthquakes in strange places, a magnitude 4.1 on the Delaware coastline at a depth of 8 kilometres is the latest "strange quake" to hit the US. The earthquake struck just about 7 miles northeast of Dover Air Force Base at 4:47 p.m., according to the U.S. Geological Survey. It was originally labelled magnitude 4.4 before the USGS lowered the scale of the temblor. According to Delaware online .com a geophysicist, Cheng Shengzao, with the USGS, said the East Coast quake was surprising. The quake occurred literally thousands of miles from a tectonic plate.